Join professional photographer Doug Steakley on this seven day photo safari to The Bwindi Impenetrable Forest in Uganda for an unforgettable close-up encounter with the mountain gorillas. You will always remember your first encounter in the highlands jungle with a large silverback and his family of several females, adolescents and babies. 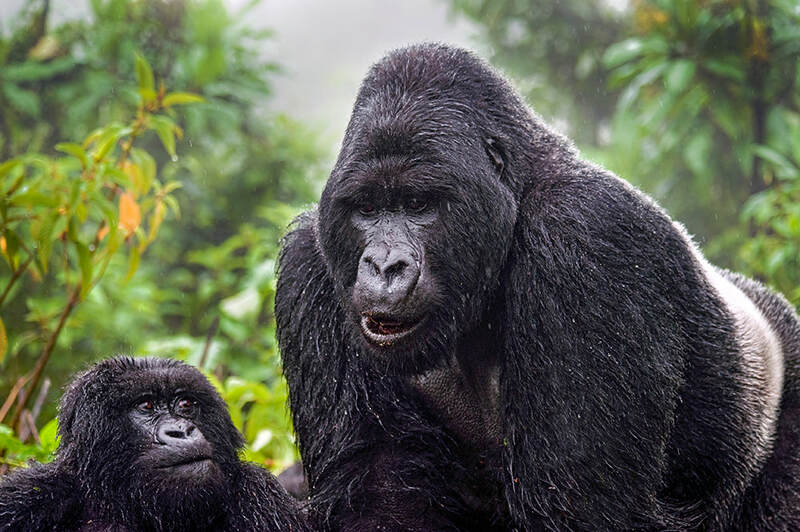 These non-aggressive, vegetarian gorilla groups are accustomed to visitors and are accessible by hiking into their habitats in the steep, forested hills of south west Uganda. We will spend five nights in Volcanoes Bwindi Lodge, a beautiful setting near the entrance of the park where we will make three treks in to see different gorilla families. Some of the groups are nearby and relatively easy to visit, while some may be higher up in the jungle and require several hours of trekking to see them. There are times when the gorillas walk through the grounds of the Bwindi Lodge and spend the night nearby. Mountain gorillas move to a different location every day, foraging for fresh food sources. Recent renovations at the Bwindi Lodge means that visitors do not have to go without western luxuries, the elegant rooms now have full modern bathrooms with his and her sinks, flush toilets and solar showers. The lodge has 8 spacious cabanas that feature comfortable king size beds covered with mosquito nets, even though. mosquitoes are rare in this locale. Each room has an outdoor seating area overlooking the adjacent forest and each comes with an assistant who will ensure that your needs are met. The rooms are cleaned daily and include a turn-down service with hot water bottles placed in the beds to add warmth to the cool mountain nights. Gorilla trekking can be a muddy affair so guests are offered complimentary laundry and shoe cleaning. All rooms are decorated in colorful fabrics often worn by locals and stunning prints of the gorillas. While the rooms have simple decorations, the warm earth tones make for an inviting atmosphere, allowing one feel at home while being surrounded by the Bwindi Impenetrable Forest. We will make three trips to visit gorilla families and this can be very helpful for having optimal light. The best light to photograph the gorillas is when the days are overcast or cloudy. Sunlight on the black fur of the gorillas creates contrast, so we will be hoping for soft light, which happens frequently in this rain-forest environment. I have made about 20 previous hikes to visit mountain gorillas families, and I will be available before and during the trip to provide assistance and answer questions about camera settings, exposure, clothing, equipment or anything else that may arise. CAN I MAKE THE HIKES TO SEE THE GORILLAS? The Bwindi Impenetrable Forest, where the gorilla families live, ranges in elevation from 4000’-8000’ and is a tropical rain-forest. 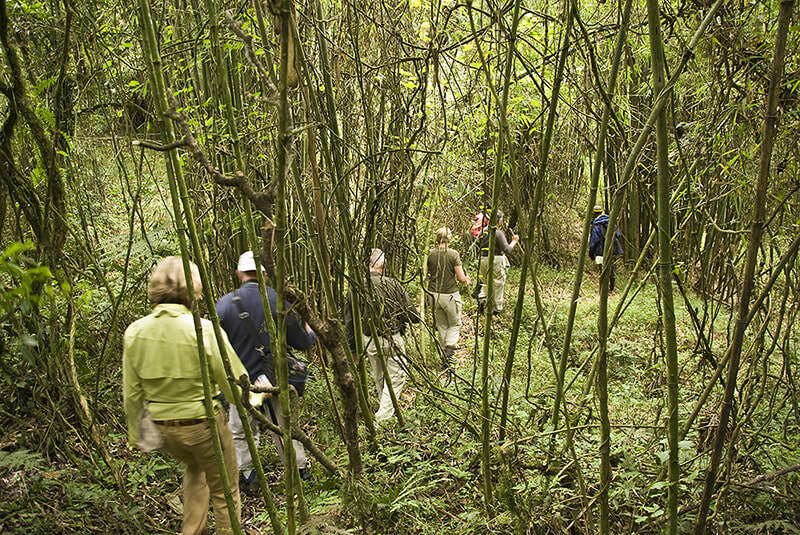 The treks begin along trails, but soon turn into following the guide and trackers through dense jungle growth. These hikes can be moderately strenuous and are not for everyone. However the pace is slow and the guides are accommodating and helpful, offering a hand when necessary. It is important to able to hike up hill at elevation at a slow pace for a couple of hours or more. Gorillas eat and move in the mornings and evenings and when we come to them they are usually resting or foraging. The guide-naturalist and trackers are very helpful and when we find the family they will often clear the brush so we will have better views and be able to see and photograph the gorillas in their natural habitat. We are asked to stay twenty feet back, but frequently a curious baby or adolescent will approach closer. At the trailhead we will meet porters who will carry our camera bags or backpacks up to the gorillas. Some of the porters were former poachers so we provide employment which assists the local economy and also provides a viable alternative to poaching. Not carrying gear in the jungle makes the hike much more pleasant and enjoyable. Our backpacks contain water, rain gear and camera equipment. it is not unusual to take hundreds of images. If we return early we will have time to relax and enjoy the lodge and surrounding forest. Arrive at Entebbe International Airport where you will be met by one of our guides and transferred to the luxurious Protea Marriott Hotel in Entebbe to overnight. If you are joining this tour from Botswana and Zambia, it will be necessary to spend the night of May 30 in Johannesburg to catch a connecting flight on May 31. After breakfast we will transfer to the airport for our one hour flight to Kihihi Airstrip. Upon landing we will be met by our local guide who will drive us for two hours to the Volcanoes Bwindi Lodge. Depending upon our arrival time we may explore the lodge grounds with its clear mountain stream or visit a nearby village. Breakfast, lunch, dinner included all days at the lodge. The approximate flying time is one hour and driving time is two hours. After enjoying an early breakfast, we will set off gorilla tracking. Trekking through the steep, densely forested hills and then finally coming across the gorillas in the vegetation is an inspiring and privileged moment. Tracking in the Bwindi forest requires stamina and sometimes can take most of the day, but the pace will be slow and porters will carry our gear. Today will be similar to the day before. We will get up for an early breakfast early and set off tracking a new family group in a different area of the forest. After two days of trekking in the Bwindi Impenetrable Forest, we will have a rewarding rest day. This will give us an opportunity to relax around the beautiful camp, get a massage or visit a nearby Batwa village. There are also several nearby walks available, including three waterfalls. Today we will set out on our final day of gorilla tracking in the Ugandan forest. We will look for a different gorilla family and hope they are not far from our lodge. 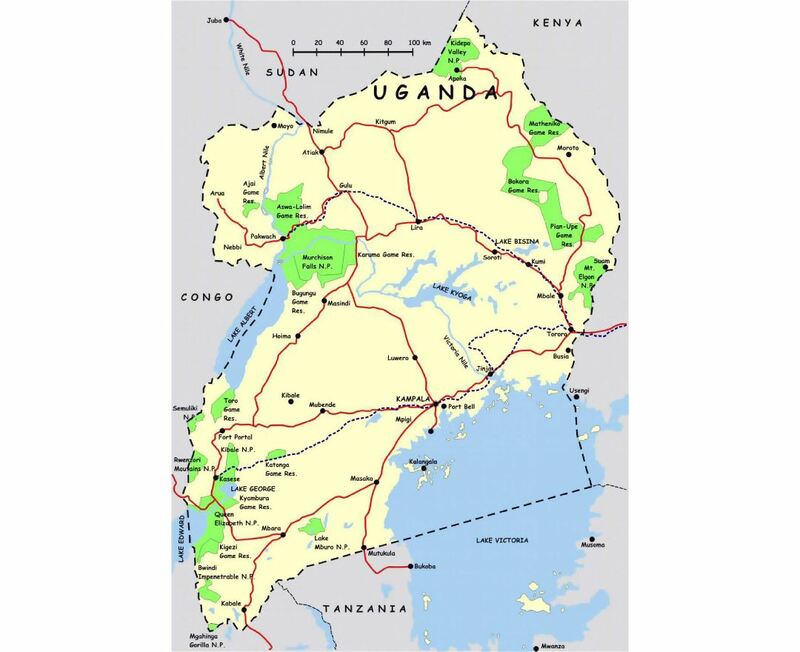 After breakfast we will transfer to the local airport for our flight back to Entebbe International Airport and connect with flights back to the USA. I will send out additional information about what to wear and what to bring well in advance of the tour. Please read the Terms and Conditions. Print and fill out the Registration Form and Liability Release Form and return them to me by mail along with a non-refundable deposit check for $2500.00. While this safari is designed with photography in mind, this is not a requirement. Non-photographers are welcome and encouraged. My experience in Africa has been that almost everyone wants to return with stunning images and improve their photographic skills., so I will be available to assist with questions about photography at all levels from beginners to advanced. The good news about visiting and photographing mountain gorillas is that you are close, the light is often perfect and sometimes it feels like they are posing. Flash is not allowed, but the guides and gorillas are accustomed to visitors with cameras. A tripod or monopod can be helpful and I recommend taking them along. However, there may be times, if there is a lot of activity, when it may be easier to increase the ISO setting and hand hold the camera. Long telephotos are not necessary, I usually use a 70-200mm or even a wider angle for some of the close encounters. If possible, it is a good idea to carry two bodies with different lenses--a 70-200 on one and a wider angle lens on the other. One hour sounds like a short period of time, but there are numerous opportunities to get great shots and there is always some interaction going on between the gorillas that makes the time with them special and unforgettable. The guides and rangers are very helpful and communicate with the large silverbacks with grunts and groans to let them know we are approaching. They will also let us know if one of the males is going to pound his chest or do a bluff charge. And the nice thing about having several visits is that you will be able to look at your images and make adjustments on following trips. I have added an optional four day extension to the Masai Mara National Park in southern Kenya. We will be staying at the Mara Bush Camp, a small but luxurious tented camp that is centrally located in an area that is full of wildlife. I just spent three nights at this camp in September, 2017, and highly recommend it. The accommodations are spacious and comfortable, the staff is truly amazing and the kitchen crew will surprise you with excellent meals. After breakfast we will transfer to the local airport to return to Entebbe. Those that are not continuing will connect with international flights back to the US, and those that are going to Kenya will connect with a flight to Nairobi. Upon arrival our group will be met and transferred to the Sheraton Hotel, which is located nearby. Four Points Sheraton Nairobi Airport. Breakfast included. We will be up early for breakfast and transfer to the Wilson Domestic Airport for our flight to the Masai Mara. We will arrive at a small, bush airport and transfer to the Mara Bush Camp for lunch, an orientation and our first game drive in the late afternoon. The Masai Mara is well known for the large variety of animals that reside there year-round, including lions, cheetah, leopards and many more. We will have three full days to enjoy and explore the beauty and wilderness of the Mara with early morning and afternoon game drives. In the middle of the day we can relax around the camp while enjoying the views of the small river below. The Masai Mara National Park is home to the annual migration of tens of thousands of wildebeests and zebra, as they trek from the Serengeti Plains in Tanzania into Kenya and back. At this time of year we should be able to see the migration as the swarms of animals line up to cross the treacherous Mara River. We will also have an opportunity to visit a well-preserved local Masai village. We will have one last morning game drive followed by breakfast. Afterwards we will be taken to the local bush airstrip for our flight back to Nairobi to the Four Points Sheraton, where we will have day rooms to nap and freshen up before connecting with our flights home. Most return flights are late at night, so the day room will be very helpful. The cost for the extension to Kenya is $3875.00 per person, double occupancy. There is an additional charge of $228.00 for the flight from Entebbe to Nairobi, and this may change at the time of booking. Please note that a visa is required to enter Kenya. E visas are available in the US prior to departure and these can be converted to a regular visa at the airport. Please do not plan to get a visa at the airport, it may take hours.